Model companies and decal companies often get this wrong. 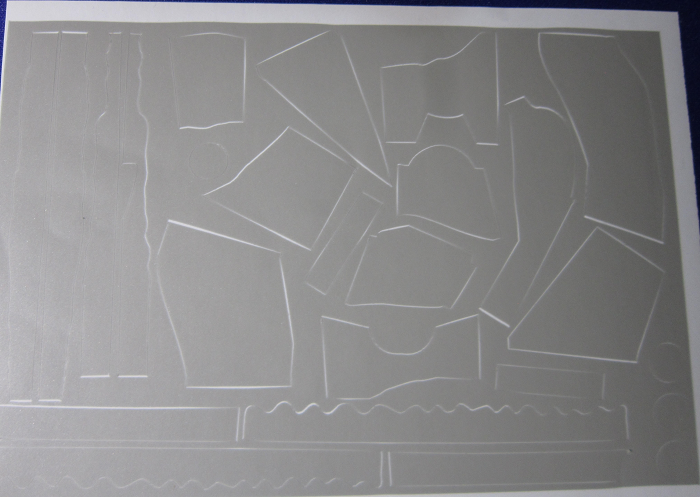 There were many more subtile differences beween different batches. 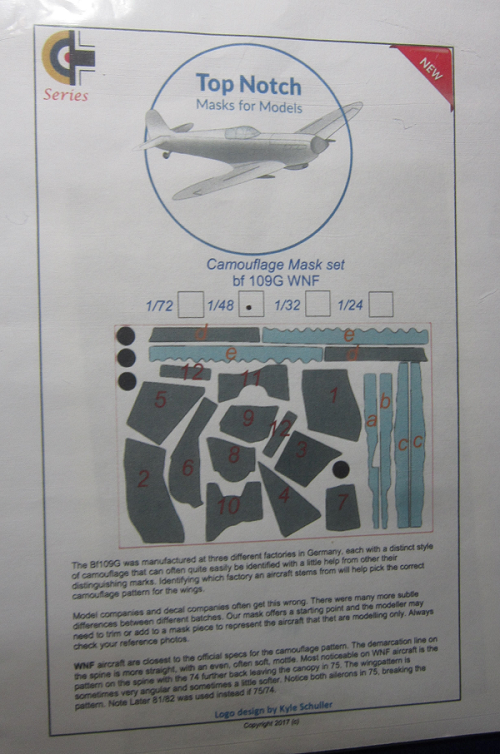 This mask offers a starting point and the modeller may need to trim or add a mask piece to represent the aircraft that they are modelling only. Alway check your reference photos. The wing pattern is sometimes very angular and sometimes a little softer. Notice, both ailerons were in RLM 75, breaking the pattern. Note - later RLM 81 (braunviolett - brown-violet) and RLM 82 (lichtgrun - light green) was used instead of RLM 74 and RLM 75. The undercarraige was usually RLM 65 (hellblau - light blue). The bottom of the sheet invites customers to join Top Notch on their Facebook group for news and discounts. Top Notch's logo is also at the top. 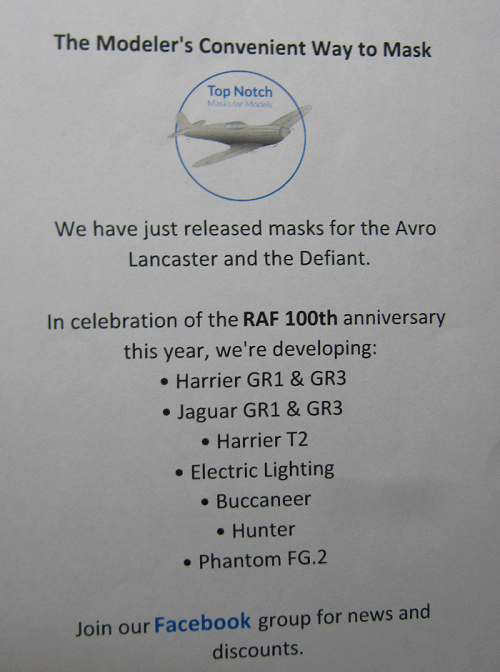 It is a circle with 'Top Notch masks for models" and a gray illustration of a Spitfire or Hurricane. There are 11 sections for the splinter camouflage, 4 sections for the wing leading edges, 2 sections for exhaust stains, 2 sections for wing walks and 4 circles for wheel rims. Logo was designed by Lyle Schuller and the copyright date of the set is 2017. 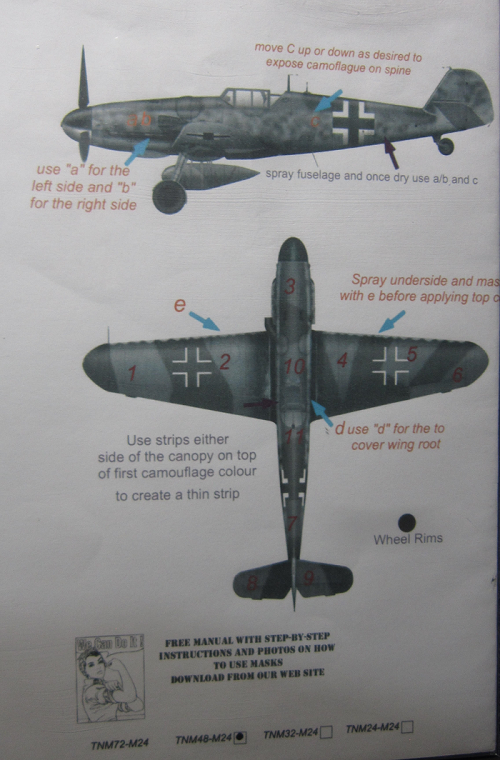 ​On the left side of the instructions is a 2-view of a Bf-109G WNF showing its side and top. Captions tell where to apply the masks. At the bottom free manual with step-by-step instructions and photos on how to use the masks can be downloaded from Top Notch's web site. A small illustration of a WWII propaganda poster appears. It shows a woman flexing her biceps and WE CAN DO IT!